The today's was to leave early (oh! that makes a change) and make our way to Medellin by early evening. Two scheduled birding stops were made in the Cauca Valley to visit Dry Forest habitat for the first time. We set off At 5:15 and drove straight to our first stop just beyond the bridge at Sinifana in the Cauca Valley, it was a lovely cool temperature as we got out of the bus but a little windy which got progressively stronger as the morning wore on. We parked the bus in a quiet lane and set off on foot up a gradually climbing track, it was so nice to be walking at low altitude, it was so much easier. 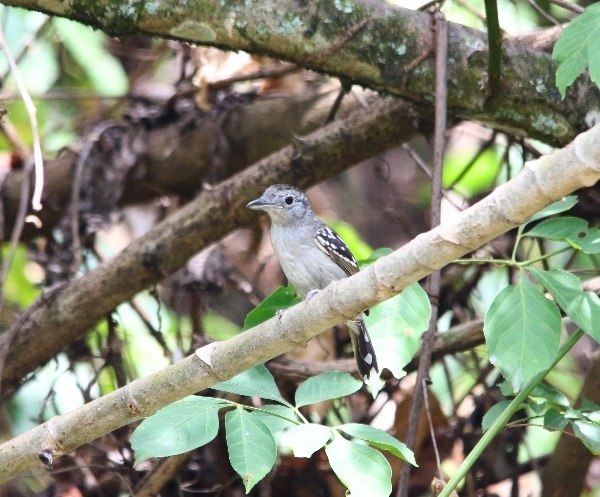 However, the birding in the dry forest wasn’t any easier than birding in the Rain Forest, birds were still hard to find. A Slate-headed Tody-Flycatcher was our first bird and it was also new for the list this was quickly followed by a sighting of our first Black-striped Sparrow, this bird featured a few times as we walked along. A small party of Greyish Piculets entertained us for a while before we found a couple of male Bay-breasted Warblers. Our main target birds were the Antioquia Wren and the Apical Flycatcher, neither of which could be bothered to show up, despite the fact that we had travelled thousands of miles to see them. 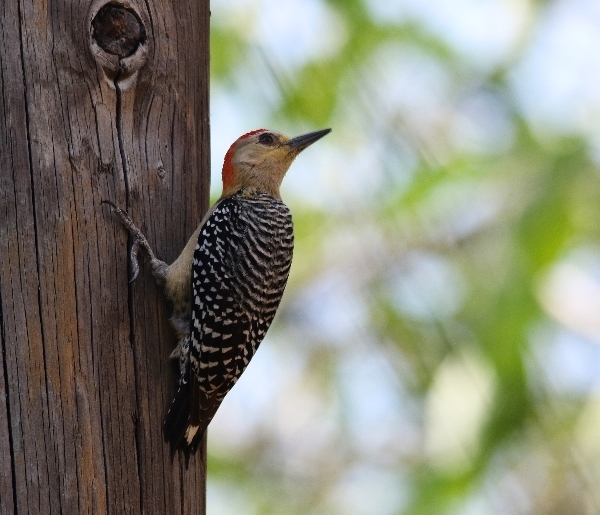 But two more goodies appeased our disappointment when we found Streaked Flycatcher and a Golden-crowned Warbler. We left the area at 8:45 because we had get back across The Sinifana Bridge before 9am as the road was being closed then for repair work. Breakfast was taken near the other side of the bridge, we stopped at a small Ranchero which had feeders in the back yard. 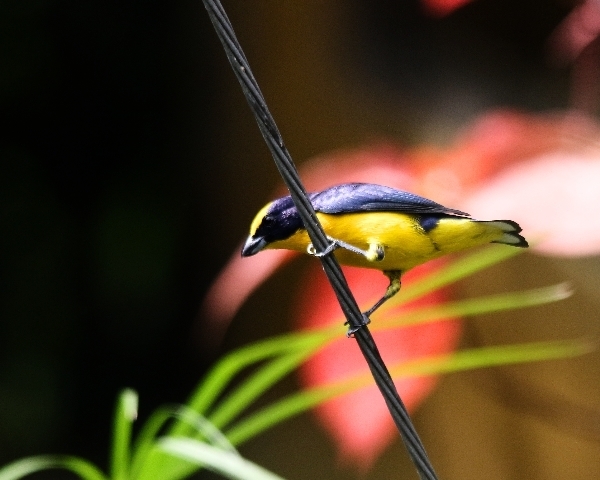 Several birds were feeding, Palm Tanager, Black-billed and Clay-coloured Thrushes, Thick-billed Euphonia and Rufous-collared Sparrows. A Tropical Mockingbird fed on nectar in a nearby tree where we also found Bicoloured Wren, Red-headed Woodpecker and Shiny Cowbirds. We ate the usual breakfast of scrambled egg, Arapa and some soft, tasteless cheese before driving on towards Medellin for another 30 minutes. Our second stop was also above the Cauca River this time on the Concordia Road, so we had to be a little careful because of the traffic, of which I have say that the drivers were always courteous, they slowed down and without exception waved or tooted their horns. The wind had picked up and the birds were very hard to find, we spent two hours along that road without much reward. We found Yellow-crowned Tyrannulet, Yellow-bellied Elaenia, Common Tody-Flycatcher and after a little wait we saw a White-breasted Wood-Wren. But it was the Antioquia Wren that we were after and after another 10 minutes or so we found one, it was hard to see but eventually we all got to see it reasonabley well (except for Ray). A very brief sighting of a Stripe-throated Hermit was had a by a few of the group before we got onto a Streak-headed Woodcreeper. We finally found a sheltered area in the lea of the hills where, all of a sudden, a lot of birds were seen flitting about. Johnnier our guide located an Apical Flycatcher by its call and we soon had that one in the bag, but things got complicated as a number of Flycatchers appeared in the same tree. 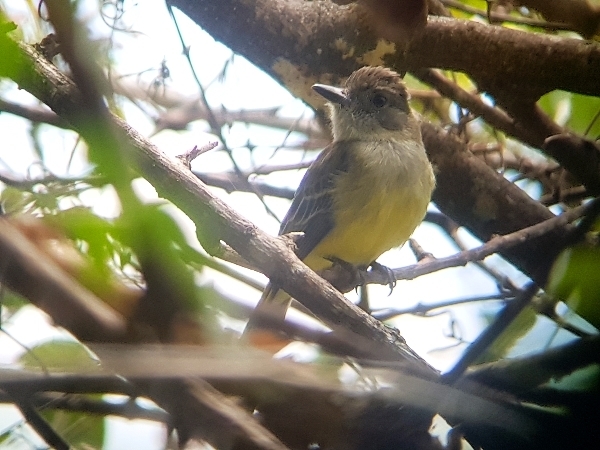 Great-crested Flycatcher joined the Apical and seemed to be associating with it. 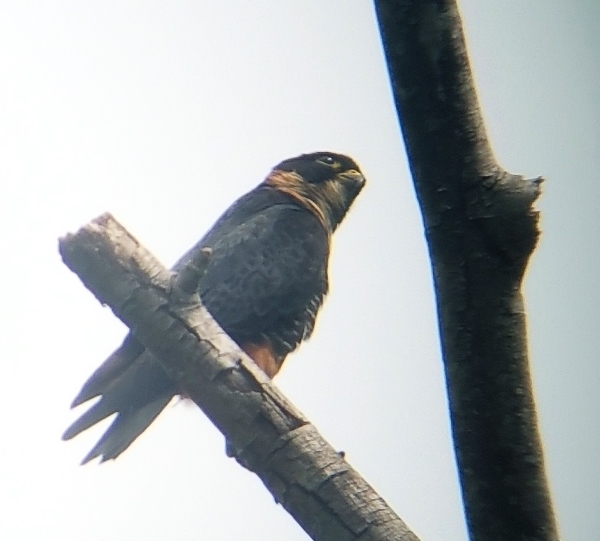 In the mean time a Bat Falcon was found seen, first in flight, then perched on a dead branch, that was nice to see. Eventually time ran out, it was 1pm when we left, we had a long drive ahead of us. We put in a couple of hours on the road and stopped for a late lunch at 3pm. It was after 4pm when we left for our final leg of the journey. 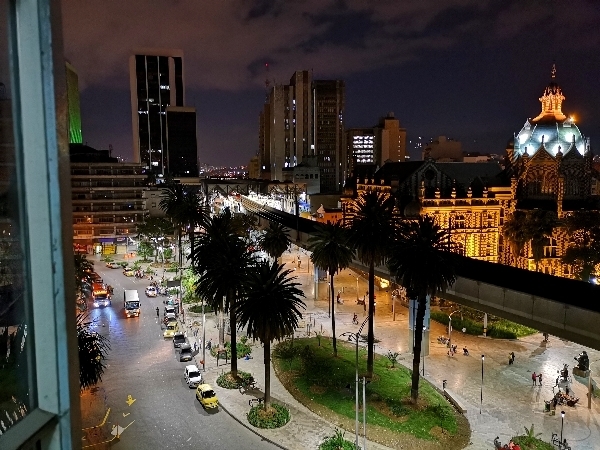 Our hotel was in the dead centre of Medellin and the traffic was horrendous, we eventually arrived at 6pm, we had seen Cattle Egret, Bare-faced Ibis,Turkey and Black Vultures, Cattle Egret and Vermillion Flycatcher along the way. From our rooms, high up on the 8th Floor we had fantastic views over a bustling city, it was vibrant out there and felt so much better than being in Bogota. Dinner wasn’t up to much but most of us weren’t really hungry after our late lunch. We called the birdlog and with 2 ½ days to go we now have just over 400 species on the list.